My haul on just the first day... Some of these items are gifts for others, though! I went a little crazy with shopping in Seoul, and the vast majority of my purchases were skincare items, mostly sheet masks. I parceled out a variety pack of sheet masks for basically all of my friends and family, and I still have several months' supply left for myself (assuming a fairly heavy usage schedule of 3-4 masks/week). I also bought a not-inconsiderable quantity of items in Taiwan, but some products were French because the in-store promotions made the products in question a bit cheaper than they would be in the US, though still not as well-priced as they are in France. It'll be a while before I get around to personally testing most of what I bought. I will probably have a post in the next week or so with quick opinions on a few items, though. For now, here's a quick guide on what stores or parts of town I would go to in Taipei or Seoul to get my skincare shopping on. Taiwan has a good range of the products that I like to buy when I'm traveling to Asia. Drugstore-like shops have a good selection of Japanese sunscreens, including my holy grail Biore face milk sunscreens. My Beauty Diary (MBD) is a Taiwanese brand that sells a wide range of good sheet masks. There are also some popular Korean brands that have boutiques in Taipei (Skinfood, Etude House, Too Cool for School, etc. ), though the prices can be marked up anywhere from a tiny bit to a lot, and I would recommend holding off on the Korean products if your itinerary includes a trip to Korea. Below are a list of stores and shopping districts that I recommend. Outside of the stores I mentioned, there are also some Japanese item-centric smaller drugstores in Taipei now,Tomod's and JP Med. I didn't shop as much there, but they have Hada Labo and a few other things. Cosmed has fantastic deals, and I regretted not discovering it on my earlier trips to Asia. 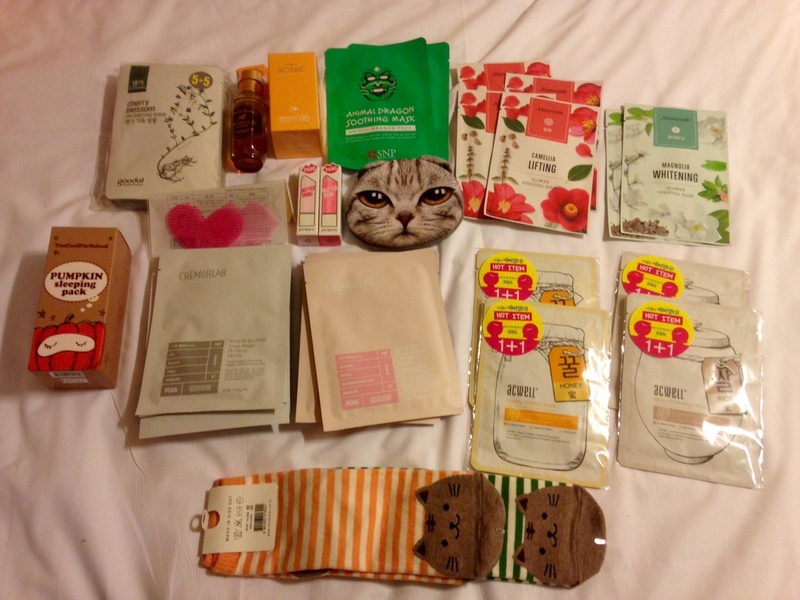 It is basically the first place I would go to get most of the items I would buy in Taiwan. With their very frequent sales, they must be one of the best places in Taiwan to shop for anything they stock. They're the main stockist for MBD masks, and with the promotional price (398 NTD for 2) I was getting my MBD masks for the equivalent of $6.20 USD/box. They also stock my favorite Biore sunscreen, which I got for $6.20/bottle on sale. Cosmed also stock many French items, including Bioderma Crealine and a wide range of Nuxe and Avene products. With sales, which were in place each time I went throughout my time in Taiwan, the prices on those are a bit better than one can generally get in the US. Cosmed has plenty of other things too, including some popular Korean items like Guerrison 9-Complex cream. Watson's is one of the major drugstore chains that are commonly found in Taiwan. I've never seen much in the way of sales there on the items that I usually look for, and I'm pretty sure the sales they do have are not as good as the ones at Cosmed. They don't carry MBD, but they carry another similar brand. They do have a good range of Japanese sunscreens, probably a slightly wider one than Cosmed. They also stock Naruko, which I've heard is a pretty good Taiwanese brand, though not one that I've personally tried out. Watson's stores can also be found everywhere, though I mainly went to the one on Yongkang Street. It's on the opposite side of the street and a few doors down from Cosmed's branch there. If you're already visiting that area for the many food options, you'll easily be able to do some shopping. Ximending is one of the main hip shopping areas in Taiwan. I actually wasn't able to make it out there this year, but in years past, I saw Etude House, Skinfood, and The Face Shop. A kind member of r/Asianbeauty made a recent map that suggests there are a few more shops I didn't see during my trips there back in the day. There's definitely at least one large Watson's in Ximending, and most likely a Cosmed in the area too. Taipei 101 and the surrounding malls are not the absolute best place for the kind of shopping I personally had in mind because the focus here is on more expensive international brands, though I'm sure the fancier brands like Shiseido or Suhlwasoo are easy to find at various department stores in the area. There are, however, a few Korean shops in the area, namely an Etude House and Too Cool for School on the first floor of the Vieshow Cinemas building, which is connected to Taipei 101 by an elevated walkway accessible from the Taipei 101 mall's second floor. TCFS is particularly marked up in Taiwan, though. It might be a little extraneous for me to include a section on Seoul because the popular brands, which I generally stuck to, are so easy to find. As I mentioned in my post on the major shopping areas that I went to, Hongdae, Myeongdong, and Insadong are all places where it is easy to find most of the huge brands like Innisfree, Nature Republic, etc. Love Health and Beauty or LOHB was one of my favorite drugstore-type stores in Seoul. I saw more that I wanted to buy there than I did at Watson's or Olive Young. Another blog has a slightly broader listing of LOHB locations than I can provide. I went to to the branches in the Hongsik University subway station and at the Lotte Mart. I didn't do that much research before I went, and I actually thought the Lotte Mart was a tiny bit difficult to find because the Seoul Station subway stop is quite sprawled out, and Lotte Mart didn't have its own label under the signs for the relevant exit. Lotte Mart is a gigantic building right by the main train station portion of Seoul Station though, so keep an eye out for that, and you can't miss it.